As 2015 arrives, we are grateful for a wonderful 2014. Small as we are, we were able to help a lot of animals. Many were taken in because they were critically ill or injured and we were able to help them back to health and on to happy homes. Our success stories have been shared here. But in rescue, it cannot always be a fairy tale ending, there will be loses. It would be wrong to forget them. Here are a few of the fallen, innocent lives that were ended too soon by tragic illness or injury. Nevertheless their memories will be cherished always. Al Pacino, his injury was more than he could overcome. And, oh! how we miss you! Pearl at Rainbow Bridge — You are not Forgotten! Pearl, you are not alone, because you were loved by us and you will not be forgotten! Pearl was a cruelty case at Animal Care Services in San Antonio, Texas. 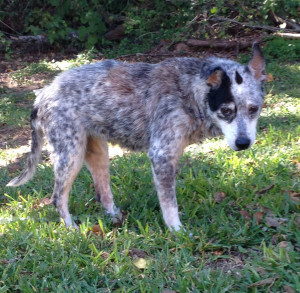 Her age was unknown but when Dr. Henry at Cypress Creek Animal Hospital in Wimberley, examined her, he stated that she was at least 15 years old. Unfortunately Pearl had a rough life. By the time Texas Animal Guardians pulled her from ACS she was in pitiful shape from years of neglect. Apparently she’d been chronically starved by her owners. ACS stated she came in severely dehydrated and emaciated. She was infested with so many fleas and ticks that she was anemic. On top of all that, she could barely walk due to severe arthritis and weakness. Worst of all, she was heartworm positive. Katy, a vet tech at Canyon City Animal Hospital, was kind enough to transport her from ACS to CCAH where she received immediate care. Pearl’s blood work revealed a chronic infection that was treated with antibiotics. The origin of the infection was unknown. The blood work also confirmed a case of severe anemia caused by a massive flea and tick infestation. Pearl was placed on a supplement to help bring her iron levels up. Her skin was in such bad shape from the flea and tick infestation that she developed yeast infections in certain patches. She was treated for this topically. Her blood work also indicated an overall inflammatory response. She had congestive heart failure (due to heartworms) and severe arthritis. The arthritis in her hips was causing her difficulty in walking. The joints in her hips were so badly deteriorated that they were bone on bone. She was placed on a short course of steroid treatment to help her with inflammation and pain. Chronic malnutrition aggravated her physical condition. To help her, Katy placed her on a high-protein diet. With Katy’s great care Pearl was responding. She was fed four meals a day to help her regain her strength. While she was in Katy’s care, Pearl did well. She was able to walk on her own, her appetite was good and she was making small improvements. Katy noted that Pearl was deaf and she appeared depressed. She also noticed that Pearl had previously suffered some type of injury to her neck that caused her to keep her head lowered. Due to a family medical emergency Katy could no longer provide foster care for Pearl. At this point, Pearl was transferred to Gyvel’s home where the plan was for Pearl to live out the remainder of her life. Gyvel had previous experience with canine geriatric care. Armed with Pearl’s medical records it was determined that Pearl would undergo acupuncture treatments to help with pain management. She was also placed on an anti-inflammatory. At first Pearl did really well in her new situation. She slept through the nigh without vocalizing (she howled when left alone), she ate well and the anti-inflammatory appeared to be helping her mobility. Acupuncture treatments were scheduled for Pearl to start but this required an evaluation first. Unfortunately, Pearl’s health took a nose dive. She stopped eating. Pearl received B-12 injections to help and an anti-nausea medication. These did help at first. Sadly she grew more and more listless. Despite trying everything to stimulate her appetite, she just didn’t want to eat. This meant that the anti-inflammatory medication had to be stopped since it could cause nausea. This in turn made her pain intolerable. By this time, she was starting to cry out in pain every time she struggled to take a step. She was taken in for further evaluation and after a thorough exam Dr. Henry stated that she was in a lot of pain, there was no recourse for her because of her physical condition and lack of appetite. Palpitating the abdominal area didn’t result in anything conclusive, although she did appear to find it painful. However, only an exploratory surgery (which she wouldn’t survive) would be able to confirm if she had an internal tumor. After another consultation with a staff veterinarian, the sad determination was made that Pearl had suffered enough. She certainly didn’t need to continue living in pain. Despite everyone’s efforts to save her and to help her, the difficult decision was made to humanely euthanize her. It just didn’t seem right to keep her alive when she’d already been in such pain and was suffering even more. She was the sweetest, bravest girl. Even though she could hardly walk she still insisted on going outside to potty right up to the end when she fell and wobbled so badly she had to be carried outside.The fondest memory is of the few times she wagged her tail. It was as if she were acknowledging some form of appreciation for making her last days comfortable. She touched all our lives in a positive way and we are glad that we were somehow able to help make the final journey of her life as comfortable as possible. 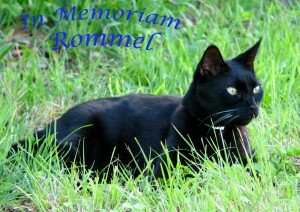 She was loved by all of us here at Texas Animal Guardians and by her temporary foster mother, Katy. In the meantime, Pearl’s cruelty case has gone to court. We can only hope that there some sort of justice was served for Pearl for all the years of cruelty and neglect she suffered. 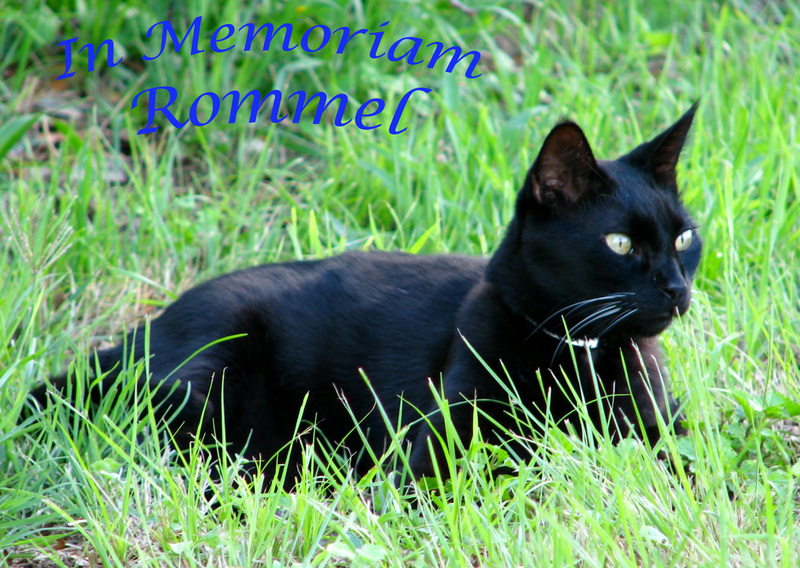 Texas Animal Guardians would like to thank Mr. and Mrs. Hennig for their very generous donation given in the memory of Missy and Rommel. It is evident that these two cats were very dear to the Hennigs. 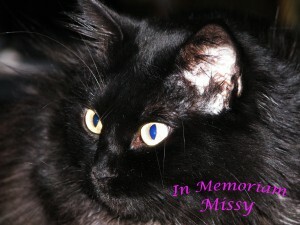 Honoring Missy and Rommel’s memory with a contribution is a wonderful way to provide healing, not only for their own loss but to help other kittens and cats with medical needs. The funds have already been set to good use providing nourishing milk formula for orphaned bottle-fed kittens. Cats and kittens suffering with various illnesses have also benefited by receiving veterinarian care and medications. 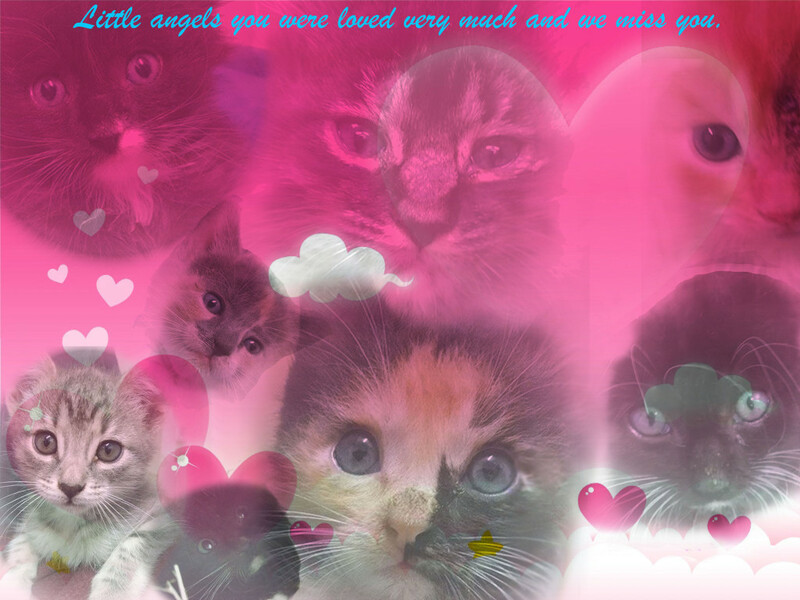 In addition, this Memoriam gift will continue to pass-it-forward as these kittens and cats grow well enough to enter our adoption program. When adopted, they in turn will become beloved family members, thereby giving back again and again. In this way the Hennig’s gift will continue to give back to others — what a wonderful way to honor the memory of Missy and Rommel. You entered my life quite unannounced. Your sudden presence rather surprised me. It’s not that you pounced upon me. No, not at all. You just came forward as if you had something important to impart to me. You entwined yourself around my legs, looked up at my face and purred the most sumptuous purr I’d ever heard. In that moment I knew I couldn’t turn you away. I opened the door bidding you into my home, my heart, my life. Oh what an astonishing thing happened to me! You ensconced yourself into my heart. I wouldn’t, I couldn’t think you’d ever depart. No, not on my part. I did not want to ever face that. But the sad fact is that all too soon you left. It wasn’t your choice, you’d have stayed — I know you would — but sickness took you from this place. Now you are gone. The longing to see you again, to touch your face can sometimes be so strong. I must remind myself you are with me in my heart, that we are never far apart — that the reality is you are only a heartbeat away from me.